A sustainable city is a livable city, indentifiable and created by its inhabitants, in tune with its local climate, culture and operations. 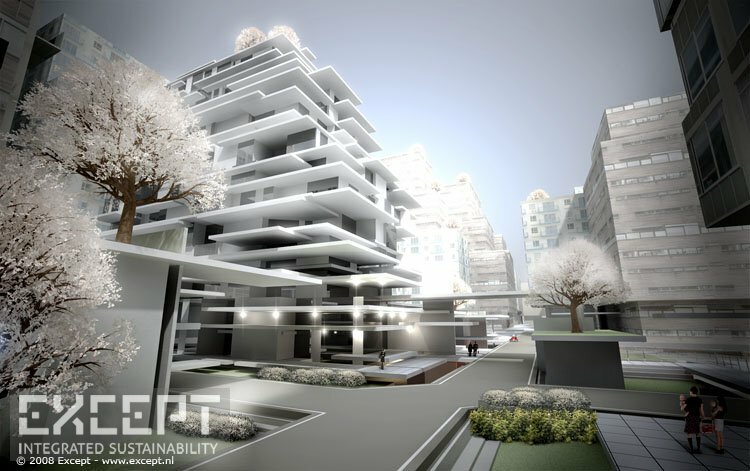 The creation of a generic solution is therefore only possible on a very abstract level, and the generation of a method for a sustainable city only interesting and valuable when applied to a real world scenario. In this project a concept was developed for an approach to sustainable decision making for program (denisty, type, distribution etc), mass, logistics, and quality of environment. Applying this necessarily becomes a process rather than just a set of rules. 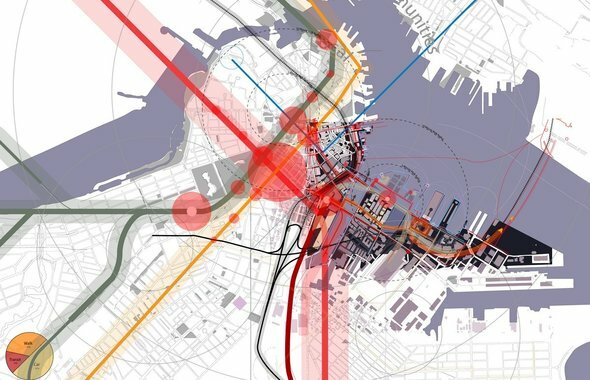 This project generates this process and applies it to a 10 acre downtown site in Boston, currently occupied by parking lots, and right next to the central business district and the ICAof Diller Scofidio. Research in energy usage shows that the United States is a larger consumer of energy per capita than any other country in the world. Roughly one third goes to transportation, one third to residential and the rest to industrial. Both transportation and residential use are impacted by the way we build our cities. In our current development trajectory, we will soon be using more land in our ecological footprint than exists. One theory for drastic change is called Deep Change. If we adhere to Deep Change guidelines we can push back our energy usage by more than half, and start building a self sufficient region. Deep Change requires certain rules for various operations in our lives, including a shift towards vegetarianism. 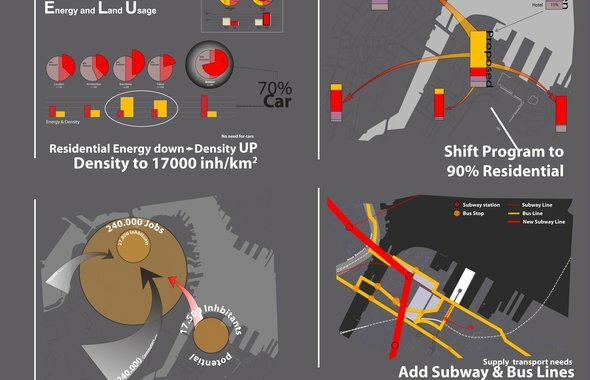 For architects and city planners, in short, it means building higher density, smaller houses, local materials, mixed use and an increasing disconnect from personalized motor traffic. Traffic takes up one third of the energy usage of the United States, of which 70% is taken up by inefficient car usage. Compared to other cities this seems unnecessary. Comparing Boston with Copenhagen, a particularly comparable city, we see a reduction of car use by 400%, and a reduction in commute. 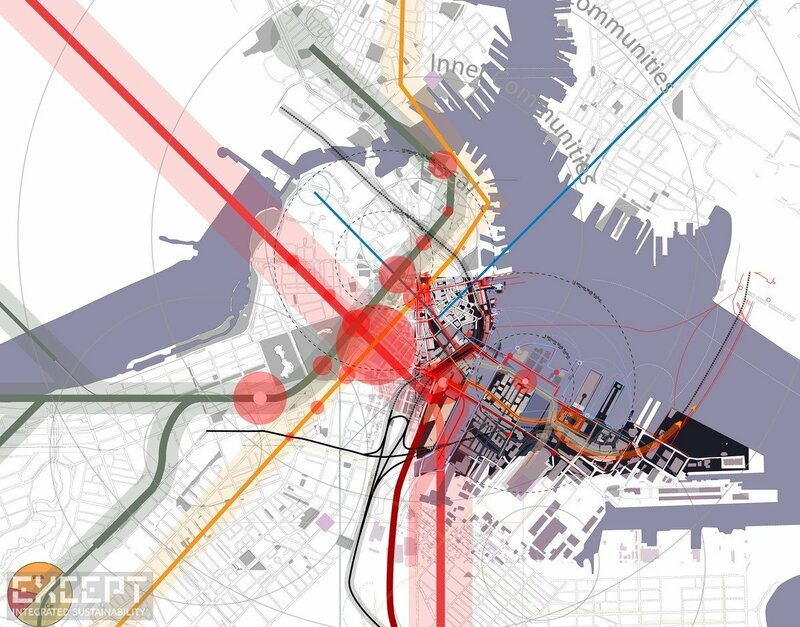 Boston center currently has 240.000 jobs, and only 27.000 inhabitants. Most of the traffic energy usage goes into commuting, and therefore relieving this by changing the programme to mainly residential is preferred. Reducing residential energy is most effective with density. Research shows an ideal around an FAR of 9. This is close to what the Eixample area of Barcelona is. So let’s increase our FAR to 9. How can we have a livable city which such high density? There are various examples around. We can learn from the city policies of these cities such as Barcelona, Copenhagen, and Amsterdam. Urban policies, pedestrian policies, traffic policies, housing policies. We end up with a large set of guidelines that we can apply to our city. There is a large focus on the quality of spaces, the human scale, activating places to make a livable high density city. 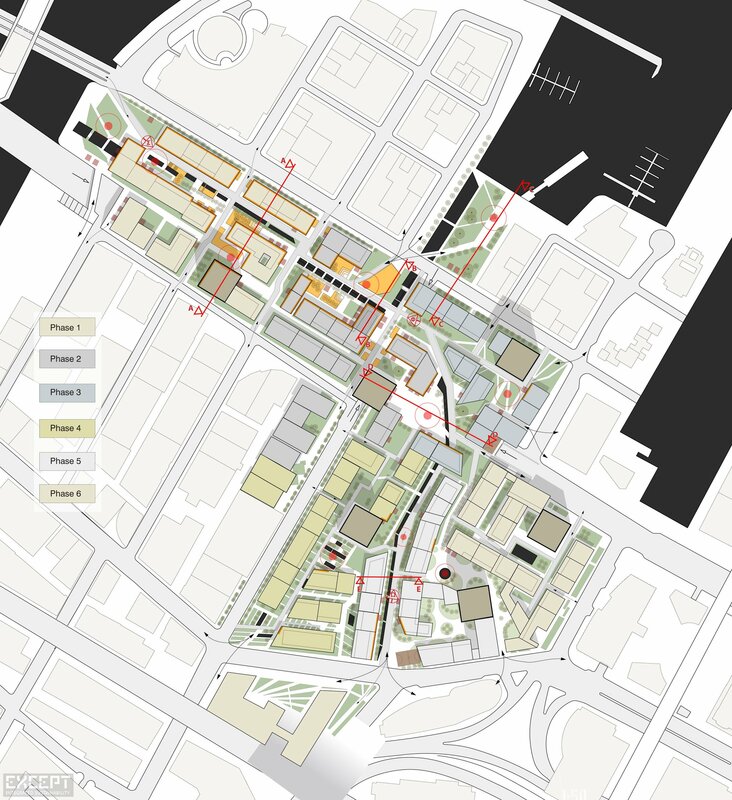 Applying these principles to the site in Boston, we shift the program to mainly residential, with retail and offices to support the residential and make it moderately self sufficient. A 20% of open space is required to have a quality urban environment, 40% preferred. Optimize land usage by burying the large thoroughfare road and eliminating cross streets. A FAR of 9 can be interpreted through high rise sparse or low rise dense fabrics. We can mix these to arrive at a diverse and flexible arrangement. The height has been kept low, to admit more sunlight into the streets, and have a more human scale. Then there are rules, for towers, scale, stepping, maximum width, arcades, green roofs, organization and circulation, and so on. These all need to be interpreted by the designer and allow for a high variety of configurations and local cultural adaptation. Car access is restricted to emergency and supply traffic. Supplied are bicycle amenities, an added subway line for the commute to downtown, merging with the existing under-used Blue line. Truck routes are maintained. 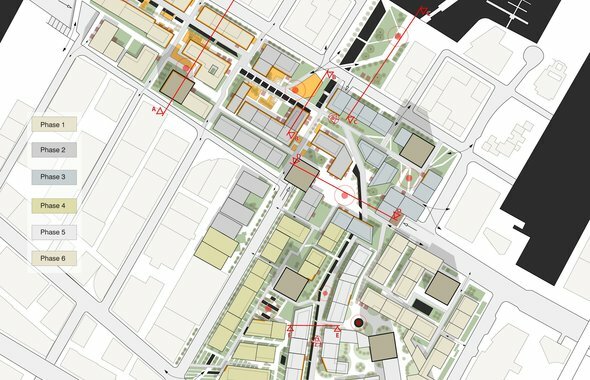 Pedestrians are drawn through the site on their way to work or to the ICA and convention center through various paths and nodes of cultural interest that tie into the existing harbor walk. Open spaces are arranged at the knuckles and alongside these paths. Section is used to densify the site more by pushing the retail under ground, and keeping it from forming a dark mass at night. 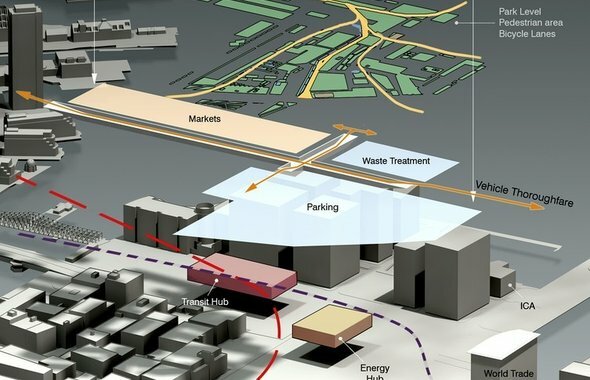 Transportation lines and hubs run under ground, keeping the ground level for more quality open space, bicycles, restaurants and entertainment. The energy hub for the collection and generation of energy is also on this level, as well as the limited parking. 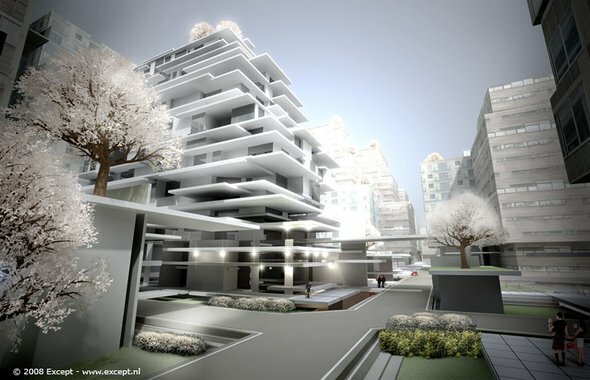 The phasing of the project is performed per single tower-community. 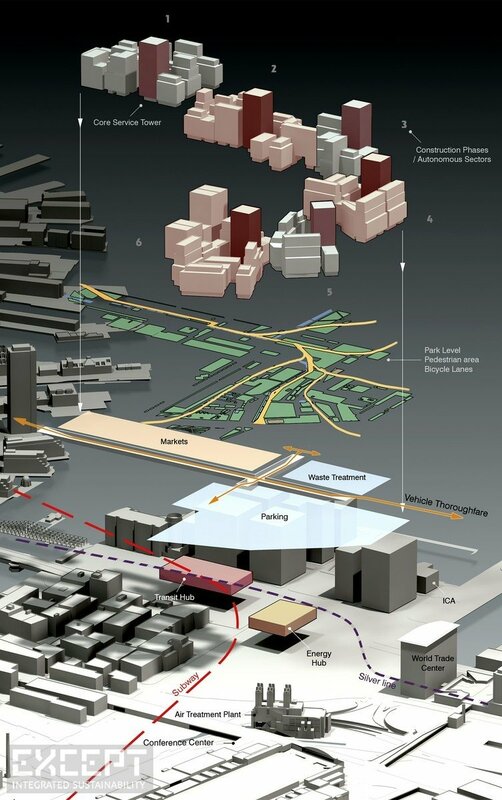 Each phase has a certain amount of occupant mass, buildings, and retail, to function of its own. Together the phases form a region that is more than the sum of their parts by sharing open spaces, and creating unique environments through landscape and organization. 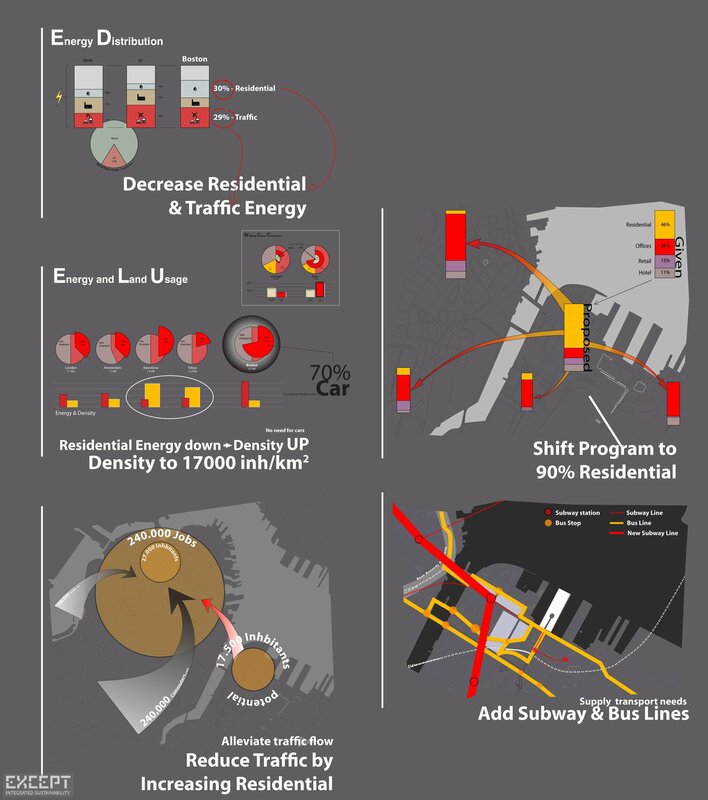 Diagrams showing the traffic, energy and density of the site.